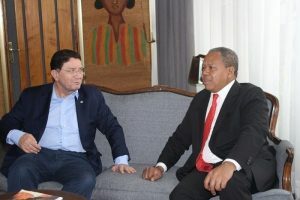 Antananarivo (Madagascar) – November 2, 2017 (travelindex.com) – The Secretary-General of the World Tourism Organization (UNWTO), Taleb Rifai has visited Madagascar to express the Organization’s full support to the tourism sector. Madagascar’s tourism is facing a challenging situation following a plague outbreak which has prompted some countries to implement travel restrictions with Madagascar. Mr Rifai recalled the World Health Organization (WHO) advises no restriction on travel or trade on Madagascar. “UNWTO is echoing the advice by WHO to governments not to rush to issue inaccurate travel advisories. The WHO Key Messages updates dated 26 October recalls that the risk of international spread appears unlikely. WHO advises no restriction on travel or trade on Madagascar based on the current available information” said Mr. Rifai.